1. Buy and read the work of poets who have had their work published. Do this regularly. See what is hot and happening. Subscribe to AT LEAST ONE literary magazine. 2. Attend live poetry readings – Some South African examples: Off the Wall in Cape Town, Poetry Africa in Durban, the Jozi House of Poetry and the Melville Poetry Festival and the Reddits monthly poetry reading sessions in Grahamstown. Also attend the launches of collections of poetry. You will hear about these by joining the mailing lists of independent bookstores, such as The Book Lounge and Kalk Bay Bay Books in Cape Town; Love Books in Joburg and Ikes in Durban. 3. Send your work to the literary magazines. Google the following names to find their contact details: New Coin, Litnet, New Contrast, Carapace, Dye Hard Press, Incwadi, Baobab Literary Journal, Kalahari Review. There are other literary magazines, and sometimes you can find lists online. There’s lots more, go read the full piece here. Inc magazine has a fascinating piece about William Roetzheim, a very successful serial entrepreneur, and a poet. For a year, Roetzheim spent six hours a day reading books of and on poetry. He eventually self-published a volume of verse and compiled an anthology, The Giant Book of Poetry, which is taught in colleges across the country. That anthology underwrites the small press Roetzheim founded to publish his work and the work of a dozen other writers. I like his approach to writing poetry. He takes it seriously, focuses, researches and reads before committing himself, and invests his own time, money and energy into self-publishing before he expects others to invest in him. I think this is a model for most poetry-writers today – and perhaps always has been. I also don’t think it’s necessary to have his money to do the same thing. Your first self-published collection could be eight poems neatly laid out on two A4 sheets, folded and stapled, and sold for a rand to your family and friends. Start somewhere, but take it seriously. Read the whole Inc.com article here. Allaboutwriting is a partnership between Richard Beynon and Jo-Anne Richards who are passionate about good writing, and have devised their courses to help communicate that passion – plus the skills that make it much more than an academic exercise. We invite you to join one of our courses either online from anywhere in the world or face-to-face in South Africa. The face-to-face courses offer you the chance to interact with like-minded writers intent not just on improving their writing skills, but on having fun while doing so. There is nothing quite as collegial as discussing solutions to literary problems with a company of people engaged in the same frustrating, exhausting, exhilarating quest to tell an engaging story as effectively as possible. The online courses offer you a one-on-one relationship with Richard, Jo-Anne or Mandy which includes personal feedback on all assignments. We love running these courses for quite selfish reasons. The fact is, during each course, we learn something we didn’t know before – or have insights confirmed by one or other of the participants – or are reminded, repeatedly, of the quite astonishing levels of talent that exist even in people who deny they’re capable of framing a well-balanced sentence. Which is why we’d love to have you on one of our next courses as you learn the delicate arts of enticing the genie out of the bottle. Go to allaboutwritingcourses.com to find out more. Two poetry magazines I admire greatly both arrived in my postbox today: English Alive and Carapace. 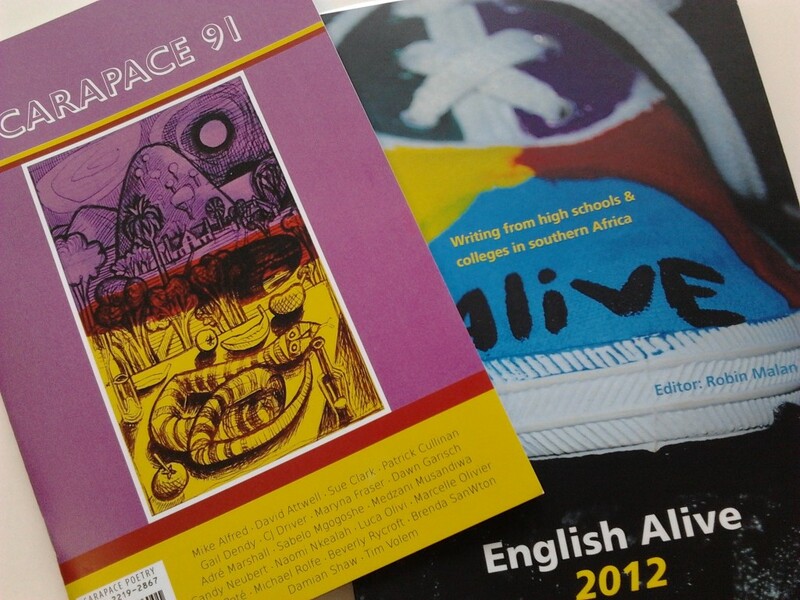 English Alive is an annual anthology of writing by South African school-goers, and this is the last issue edited by the legendary Robin Malan, who is retiring from the editorship after many years. Robin deserves several lifetime achievement awards for his contribution to South African literature, because for many writers, English Alive is the first place they are published and recognised for their early work. Go and order your copies on the English Alive site. If you’re at school, you can also find out how to submit your work to English Alive. Carapace is edited by another giant of South African literature, Gus Ferguson. I believe for consistently high-quality poetry Carapace is unrivalled in South Africa. My subscription to Carapace costs me R200 for six issues, which is ridiculously cheap. (To subscribe, write to PO Box 12020, Mill Street 8010, Cape Town South Africa.) This month’s issue includes writing by a range of top local writers, including Mike Alfred, David Attwell, Sue Clark, Patrick Cullinan, Gail Dendy, CJ Driver and others. If you aim to one day be published in Carapace, read every issue you can get hold of. You’ll learn a lot from these amazing writers. And, a bonus, Carapace always includes lovely drawings, too. Digital publishing and print on demand have significantly reduced the cost of producing a book. The phenomenal growth of e-readers and tablets has vastly expanded the market for e-books, which can be self-published at little or no cost. Writers who self-publish are more likely to be able to control the rights to their books, set their books’ sale price and keep a larger proportion of the sales. But one thing has not changed: most self-published books sell fewer than 100 or 150 copies, many authors and self-publishing company executives say. There are breakout successes, to be sure, and some writers can make money simply by selling their e-books at low prices. Some self-published books attract so much attention that a traditional publishing house eventually picks them up. I highly recommend reading the article. Masonwabe said here recently that he writes lots of poems when he’s hurt or sad. Writing poems is a great way to think through difficult times. Poems we write for other people to read in books or magazines. Each one requires a very different kind of writing style. When you write a poem for yourself, you can write using phrases and images that only you understand, or only meaningful to you. Other people reading this poem will see that you are struggling with something, but they won’t feel the same as you do, because your phrases and images are just for you. If I write “She left me feeling like a toffee apple”, you don’t know what I mean. Is it good or bad to feel like a toffee apple? Who knows. I know, because in my mind I know what “toffee apple” means to me and my history. But you have no way of knowing. So my poem will not make you feel anything that makes sense. This poem may be important for me. But I don’t expect you to want to buy it in a book. When you write a poem for performance, you are writing down the words of a script that you will add to with your voice and your body language when you perform it. These poems are like song lyrics: lyrics written down often don’t make sense. Sometimes they even seem silly when you read them on paper. Only when they are performed do they come alive and make sense. If I’m on stage and I whisper, smiling with my eyes closed, “She left me feeling like a toffee apple”, now you have an idea of what I mean: I felt happy and sweet and maybe even tasty! Performance poems also tend to rely a lot on rhythm and repetition and the poet’s real-life personality. If you want to get published, you have to write poems intended for others to read. Before you plan to publish poetry, think carefully about what kinds of poems you are writing.